1700 – Look What Day It Is! 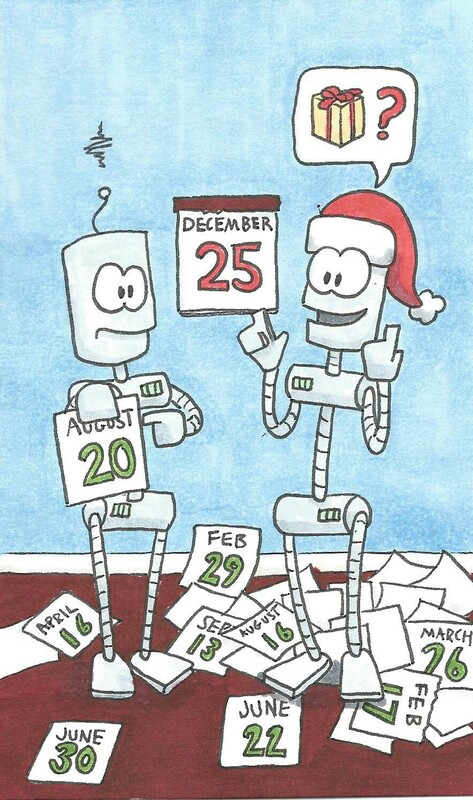 Also, I got you a new calendar for Christmas. The calendar had thirteen months. was chosen by the Holy Pope. But thirteen months was much too long. The calendar was clearly wrong. But thanks to Caesar, months were changed. Their names and lengths were rearranged. for fifteen hundred years or so. But was it perfect? Close, but no. when Feb. the 29th appears. 2000 leaped like all the rest. is better than it’s ever been. Major props go to Matt R. Of Birmingham, AL who won doodle #1700 and the option to chose the theme for the doodle and poem in a one-day auction on the Lunchbox Doodle facebook page. Ever the joker, Matt challenged me with the theme of “Widespread Adoption of the Gregorian Calendar.” Here’s hoping I lived up to the challenge! 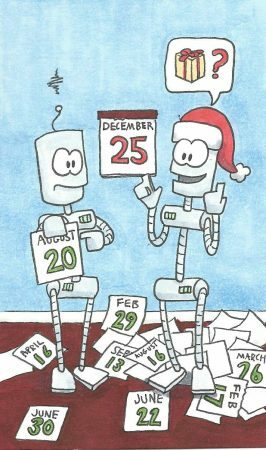 Author Samuel KentPosted on August 20, 2016 November 30, 2016 Categories Lunchbox Doodles, poemsTags Bink and Bonk, custom doodles, lunchbox doodles, poems, robotsLeave a comment on 1700 – Look What Day It Is!